It's been more than a month since I received my package from KPOP2.com. I feel so bad coz I do not have time at all to make the review. Actually I've took some pictures of thee lenses since the beginning of july. I just didn't have much time to edit the pictures even write the review. Yeah I was so busy of 'collage life' during last month. 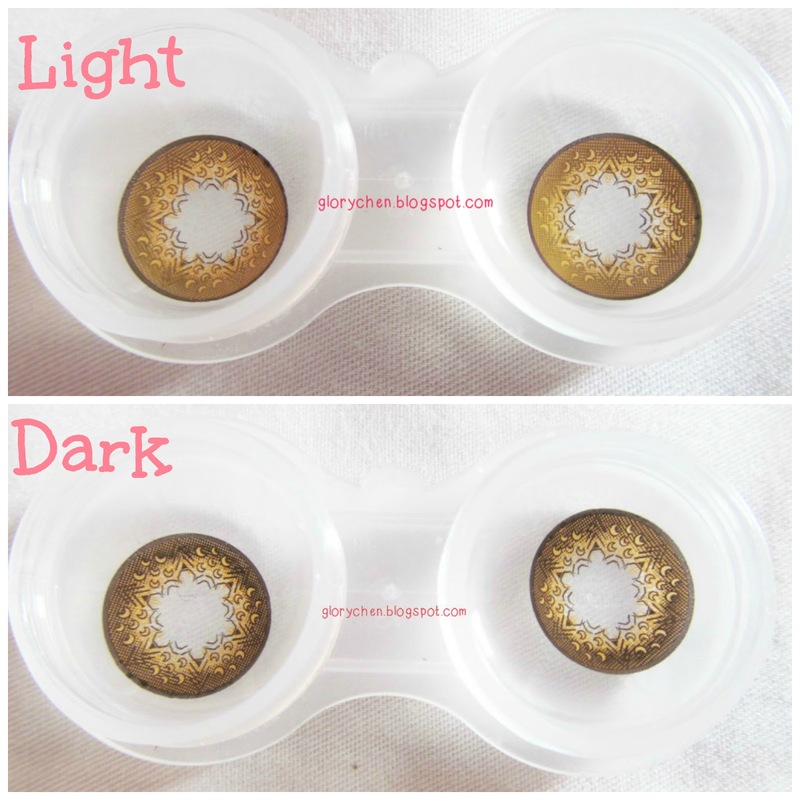 But, now Im here to share my thought about this pretty lenses, Moonlight Brown 13.9mm that KPOP2 sent me. If you're not familiar with KPOP2, then please pay a visit to KPOP2.com to look around their pretty & cute circle lenses collections. Their website feature 300 different kinds of cheap colored contact lens and basically their products also Korean girl & boy idol group favorites. All products in their website are 100% made in Korea and authorized by Korean FDA. 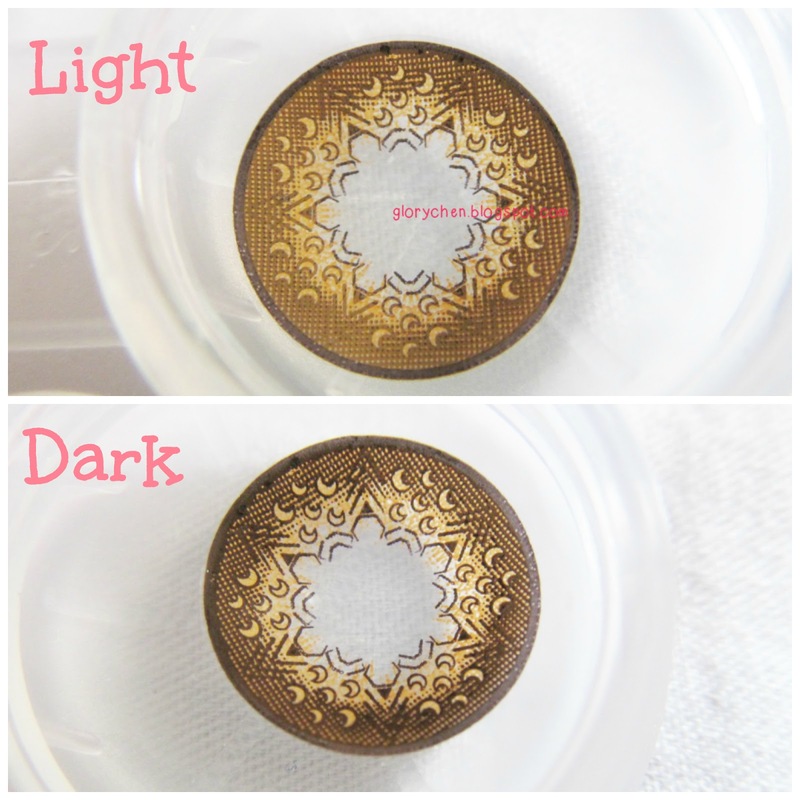 Most of their circle lenses valued $10.99 and Im not sure you will find the great deals like this in other circle lenses website. 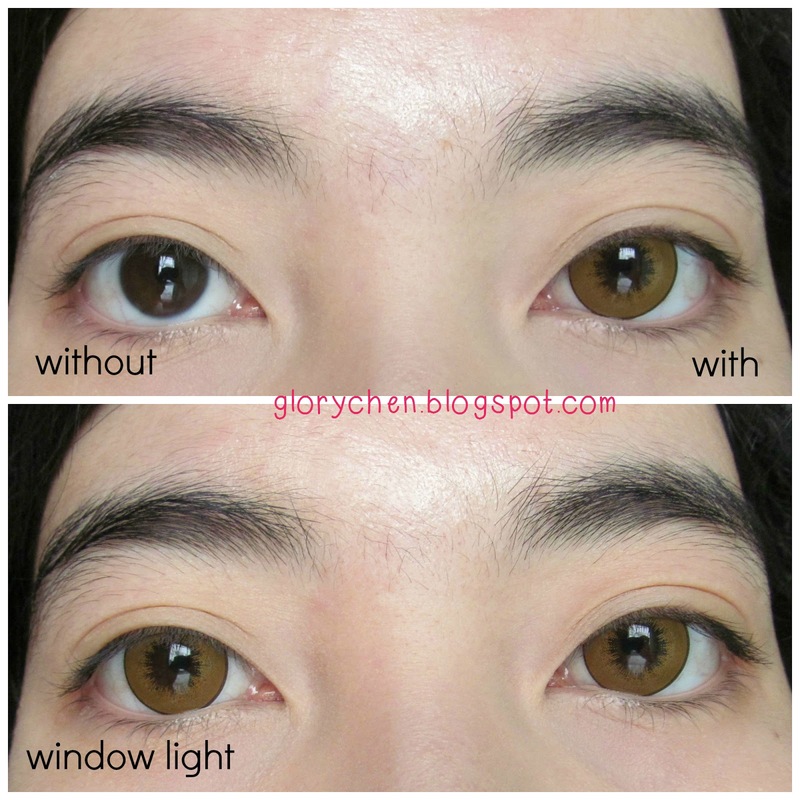 So, besides Lettuce Brown lenses (Review here), I also got Moonlight Brown 13.9mm from KPOP2. Actually, I chose both design & color. I chose brown circle lenses coz essentially my natural eye color is brown & I just want a 'natural-look' circle lens. I've already tried some pop colors circle lenses like purple, blue, green, and grey. That's why I was so excited to try the brown color. Maybe I will choose the other circle lens colors next time. LOL. They come in these individual glass bottles with each lenses inside and filled with the lens solution. I usually a bit annoyed when opening the circle lens packaging, because the lid generally coated aluminium seal and I need to be more careful or it could injured my fingers. But they must be sealed tightly to make sure they're safe & full protection. Even though they are only 14.8mm overall diameter, but I'd say these does a pretty good job making the eyes look bigger, natural, and dolly. Sorry I didn't use flash light coz I think the window light had already made my eyes look very clear.. I think the dark side of this lenses and compared to my bare eyes looks quite the same. This side just gives a 'quite big' effect and dolly look. 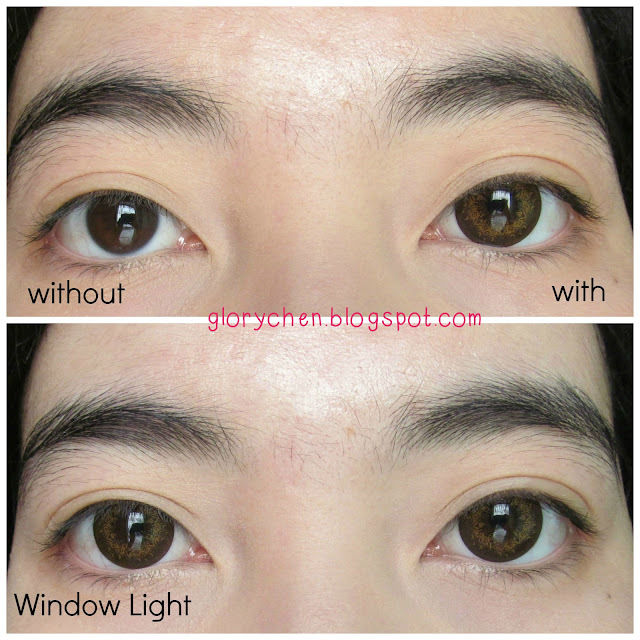 gmn maksudnya kok km pake bagian dalemnya softlens? :O ga boleh pake terbalik loh.. pantesan aja jd sakit dear..
Oh sweetie that circle lens looks very pretty and natural on you. Provides that lens a big enlargement! Whoa, they really make you look more doll-like. Are they uncomfortable to wear? I normally wear contacts so I guess I would have to get prescription circle lens. Looks very animated yet dolly ^^ Cute. Wow Nice post, your blog post is amazing ! I accidentally drop by your blog uninvited and found your interesting blog . The layout of your blog and information is wonderful. Your blog post is mostly about Fashion and beauty stuff. 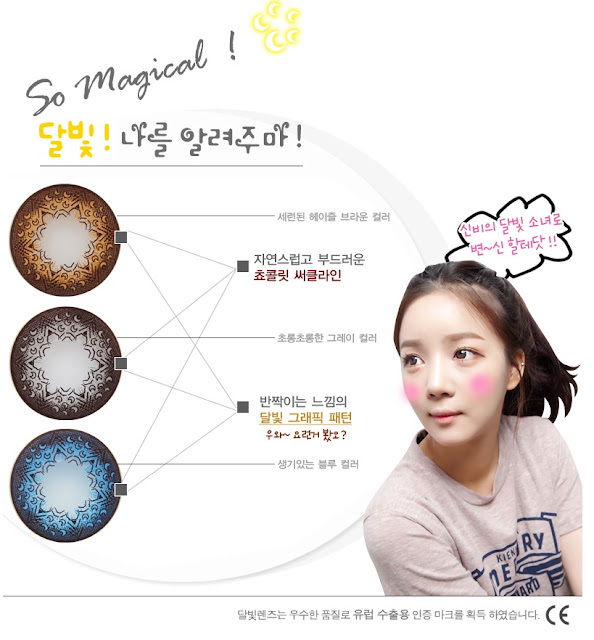 www.contactlensxchange.com for more exciting brand colored circle lenses. Solution-Lens shop has "BUY 2 GET 1 FREE" and free shipping offer for Halloween, do you know any better discount ? Thank you. nice post! :) i think the dark ones look greater on you :D check here for cheap brown lenses too! Great post. Nice pictures. Love all the pictures and also the contact lenses. Hi! Im Glory Chen, a Surabaya resident who currently lives in Jombang and also a wife & mommy at home. I love to play makeup especially ulzzang/gyaru makeup is my most favourite makeup. I also enjoy to watch a lot of K-Dramas as much as I enjoy to go on trip. I also thankful for visiting my blog even it just a random visit, but I hope you have a memorable time in your short visit on my blog. xoxo.